That F'ing Monkey: Flash Friday: Justice League: Attack of the Legion of Doom! Flash Friday: Justice League: Attack of the Legion of Doom! Happy Flash Friday everyone! It’s been awhile since I’ve done one of these. I was in the store this week for something completely different when I ran across the newest Lego movie. 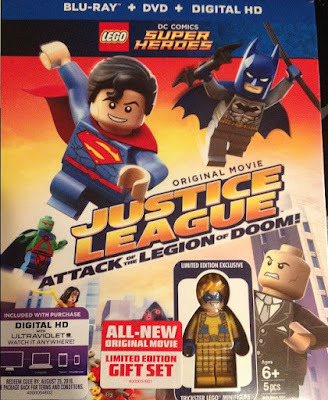 I knew a Lego Justice League movie was coming out, but I wasn’t paying attention to what was coming in the packaging. 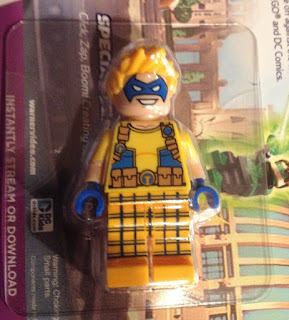 Right now you can get either a DVD or Blu-Ray version of the movie and a Trickster mini-figure. I honestly would have passed on this but getting a movie I can probably enjoy with my son and another member of Flash’s Rogues was too good to pass up. I just picked the movie up last night, so I haven’t had a chance to watch it. I’m going to make a guess that it follows their other direct to video offerings. It’ll be somewhat goofy and will have a handful of lines that make the adults smile. There will be a couple good Easter Eggs for DC comic fans but nothing to amazing. That’s my guess, because that’s what has come before it. It I’m completely wrong I’ll post another article about it. Obviously Trickster was my main reason for picking this up and I think he looks great. As far as Flash villains go he joins Captain Cold and Gorilla Grodd. Hopefully the success of the TV show will increase the visibility of the Rogues. I’d really like to see Captain Boomerang, Weather Wizard, and Heatwave show up in Lego form.